The Brief: How do Texas voters feel about Trump? "The Brief: How do Texas voters feel about Trump?" was first published by The Texas Tribune, a nonprofit, nonpartisan media organization that informs Texans — and engages with them — about public policy, politics, government and statewide issues. • The theme: Republican voters in Texas still back Trump. Among Republicans in the state, 80 percent approve of the job the president is doing. "Texas Republicans are holding steady," said Jim Henson, co-director of the poll and head of the Texas Politics Project at the University of Texas at Austin. "They continue to embrace him." And among Democrats, 90 percent disapprove. But overall, around 40 percent of Texans approve of Trump's work, while 51 percent disapprove. • But some are torn over Trump’s competency. Forty-six percent of Texans said the president is competent, while 47 percent said he isn’t. When broken down along party lines, just 9 percent of Democrats said Trump is competent compared to 80 percent of Republicans. • What about Russia? Two in five Texas voters — predominantly Democrats — believe Russia influenced the 2016 election and in a way that benefitted Trump. A little less than 50 percent of Texans said they have a favorable opinion of the FBI, the federal agency carrying out much of the investigation surrounding Russia's attempts to meddle in the election, while 26 percent view the agency unfavorably and 29 percent have no opinion. What do you think of President Trump’s performance and the FBI’s handling of the Russia investigation? Tweet us with #MyTexasTake. • After four people, including a staffer for a Texas congressman, were shot at a congressional baseball practice, U.S. Reps. Kevin Brady and Roger Williams described a harrowing day. • After the city of San Antonio annexed his home, Mike Stewart is hoping the upcoming special legislative session will give him a say. • The Texas Legislature passed "sanctuary" legislation this year, but efforts to enforce a mandate requiring state agencies and contractors verify the employment eligibility of their workers again fell short. • Gov. Greg Abbott is pushing for legislation to pre-empt local ordinances on drivers' mobile phone use — a measure that could weaken city ordinances in more than three dozen Texas cities. • Speaking to hundreds of educators as the special legislative session looms, House Speaker Joe Straus needled the Senate on public education funding and the "bathroom bill." • A couple mayors in North Texas are rejecting the protectionist "Buy American" iron and steel law that's set to go into effect Sept. 1. • Texas tapped an Austin-based company to manage the first state-run gold depository in the country — and it may open as early as January. 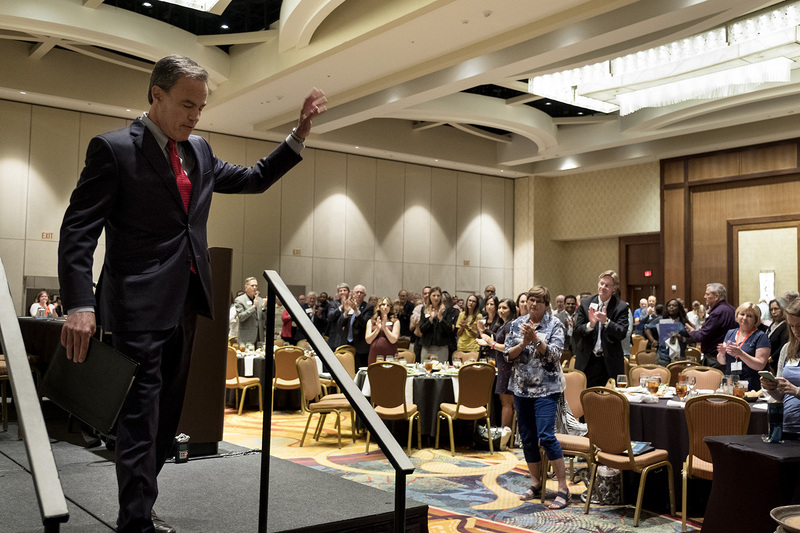 Texas House Speaker Joe Straus leaves the stage after speaking at the Texas Association of School Boards' annual summer leadership institute in San Antonio on June 14. Photo by Laura Skelding. See more photos on our Instagram account. "Jeff Flake got his belt off and put a tourniquet on his leg and stopped the bleeding." — U.S. Rep. Roger Williams, R-Austin, about U.S. Sen. Jeff Flake, R-Arizona, offering aid to his own staffer, who was among those shot during Wednesday's congressional baseball practice. The Brief: How do Texas voters feel about Trump? By Cassandra Pollock June 15, 2017 Good morning and happy Thursday, folks. Thanks for reading The Brief, our daily newsletter informing you on politics, public policy and everything in between. Forward this email to friends who may want to join us. They can sign up here. — CP What you need to know More than 50 percent of registered voters in Texas don't believe President Donald Trump is honest and trustworthy, while 35 percent think otherwise, according to the latest University of Texas/Texas Tribune poll. 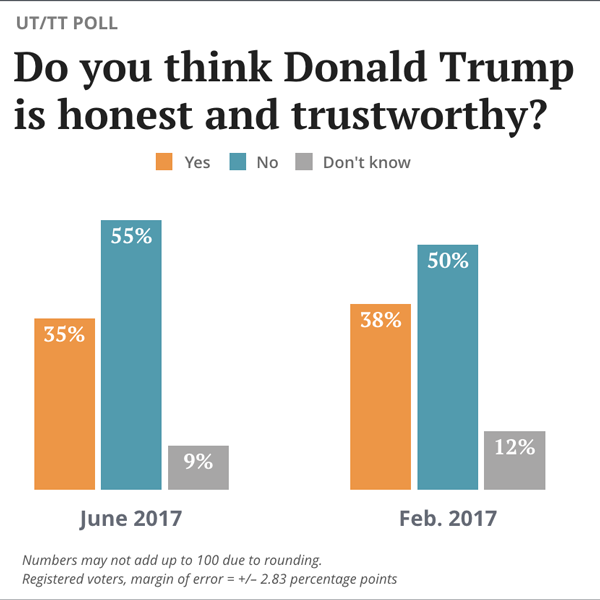 That’s a slight decline from February's UT/TT Poll, where 38 percent said he was trustworthy and half said he wasn't. Here's what you need to know: • The theme: Republican voters in Texas still back Trump. Among Republicans in the state, 80 percent approve of the job the president is doing. "Texas Republicans are holding steady," said Jim Henson, co-director of the poll and head of the Texas Politics Project at the University of Texas at Austin. "They continue to embrace him." And among Democrats, 90 percent disapprove. But overall, around 40 percent of Texans approve of Trump's work, while 51 percent disapprove. • But some are torn over Trump’s competency. Forty-six percent of Texans said the president is competent, while 47 percent said he isn’t. When broken down along party lines, just 9 percent of Democrats said Trump is competent compared to 80 percent of Republicans. • What about Russia? Two in five Texas voters — predominantly Democrats — believe Russia influenced the 2016 election and in a way that benefitted Trump. A little less than 50 percent of Texans said they have a favorable opinion of the FBI, the federal agency carrying out much of the investigation surrounding Russia's attempts to meddle in the election, while 26 percent view the agency unfavorably and 29 percent have no opinion. Now, your take What do you think of President Trump’s performance and the FBI’s handling of the Russia investigation? Tweet us with #MyTexasTake. Tribune today • After four people, including a staffer for a Texas congressman, were shot at a congressional baseball practice, U.S. Reps. Kevin Brady and Roger Williams described a harrowing day. • After the city of San Antonio annexed his home, Mike Stewart is hoping the upcoming special legislative session will give him a say. • The Texas Legislature passed "sanctuary" legislation this year, but efforts to enforce a mandate requiring state agencies and contractors verify the employment eligibility of their workers again fell short. • Gov. Greg Abbott is pushing for legislation to pre-empt local ordinances on drivers' mobile phone use — a measure that could weaken city ordinances in more than three dozen Texas cities. • Speaking to hundreds of educators as the special legislative session looms, House Speaker Joe Straus needled the Senate on public education funding and the "bathroom bill." • A couple mayors in North Texas are rejecting the protectionist "Buy American" iron and steel law that's set to go into effect Sept. 1. • Texas tapped an Austin-based company to manage the first state-run gold depository in the country — and it may open as early as January. News from home Register for the 2017 Texas Tribune Festival! Join us for three days of the best conversations in politics and public policy, Sept. 22-24. Register here. What we're reading Links below lead to outside websites; we've noted paywall content with $. The hero cops who prevented a congressional 'massacre,' The Daily Beast &nbsp; Former justice of the peace sues county, The Monitor&nbsp; Amarillo Sen. Kel Seliger says timing wrong to study I-27 expansion, Amarillo Globe-News&nbsp; Austin requires a permit for kids' lemonade stands. Troxclair wants to change that, The Austin American-Statesman ($)&nbsp; Collin County fights to rid itself of costly Ken Paxton lawsuits, The Dallas Morning News ($)&nbsp; Special counsel is investigating Trump for possible obstruction of justice, officials say, The Washington Post ($) Photo of the day Texas House Speaker Joe Straus leaves the stage after speaking at the Texas Association of School Boards' annual summer leadership institute in San Antonio on June 14. Photo by Laura Skelding. See more photos on our Instagram account. Quote to note "Jeff Flake got his belt off and put a tourniquet on his leg and stopped the bleeding." — U.S. Rep. Roger Williams, R-Austin, about U.S. Sen. Jeff Flake, R-Arizona, offering aid to his own staffer, who was among those shot during Wednesday's congressional baseball practice. Feedback? Questions? Email us at thebrief@texastribune.org. As always, thanks for choosing The Brief — if you liked what you read today, become a member or make a donation here. Disclosure: The University of Texas at Austin has been a financial supporter of The Texas Tribune. A complete list of Tribune donors and sponsors can be viewed here. "The Brief: How do Texas voters feel about Trump?" was first published at by The Texas Tribune, a nonprofit, nonpartisan media organization that informs Texans — and engages with them — about public policy, politics, government and statewide issues. Link back to the original article, which is located at https://www.texastribune.org/2017/06/15/brief-june-15/.